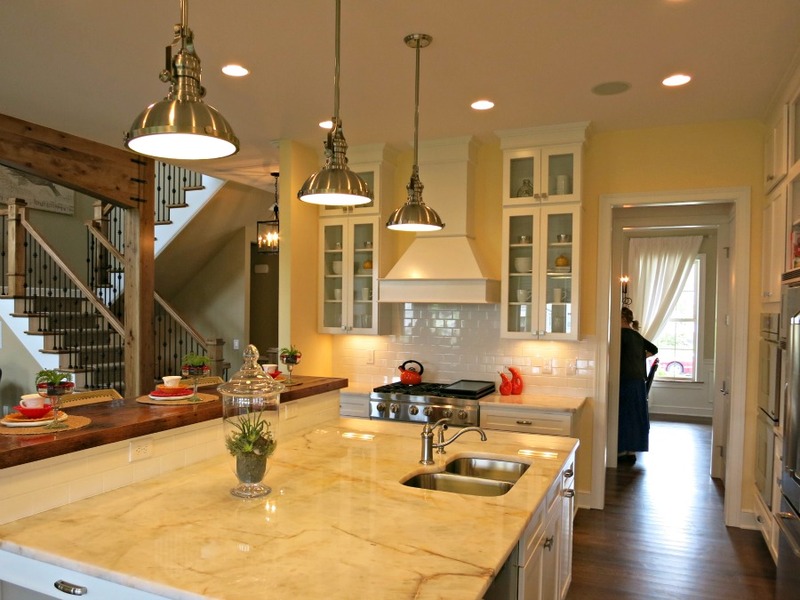 I was able to arrange a tour in advance at the 2013 BIA Parade of Homes. Most homes were in the middle of their final preparations, but the good folks at Prism Construction gave me a tour of their entry. They have created a Neo-Georgian style home filled with technology you wouldn't find in an original Georgian style home. It is a good looking Georgian house they have created, but modern builders have to deal with attached garages that automatically make anything Georgian look a little odd. In a Georgian home the whole structure is symmetrical. Tack on a garage off the side and your symmetry is blown. One solution would be to provide a garage on either side. Prism took a different approach. 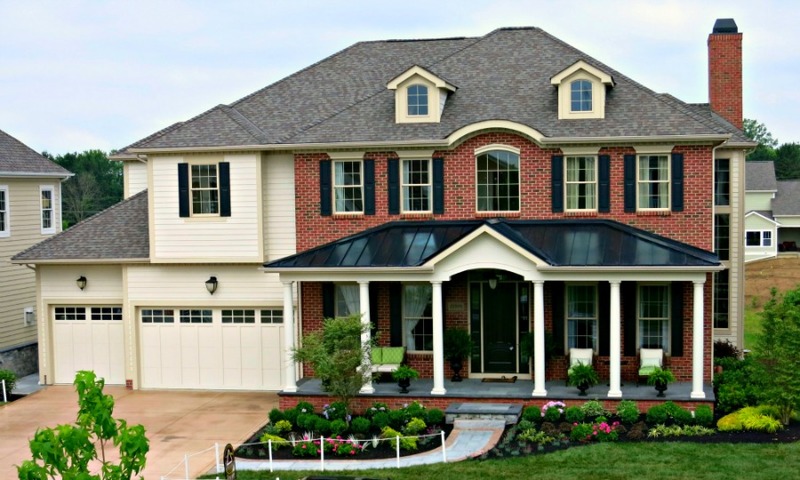 They created a symmetrical house that is brick and Georgian. Then they added a lap-sided addition that wraps around back. It is not truly Georgian but the part that stands out is the brick part, and that is Georgian. They were smart enough to side the non-Georgian part in a neutral cream. The red of the brick pops while the cream stays in the background. Adding to this the cream addition, which includes the garage, is slightly recessed. The result is a nearly successful subduing of the garage, which I support. I did use the word nearly. The garage wing should probably have been recessed back more like ten feet instead of a few inches and this would have created a greater dominance of the house over the garage. Having slammed them for their garage you might think that I don't think well of this house or the builders. You would be wrong. The garage problem on a historical style is a tough nut to crack. And the house does look very nice. I just have my pet peeves and this is one of them. Mike Hamill and Jim Dearing are the owners of Prism, and I know I just spelled Jim's name wrong. (Note to self - don't start writing when its too late at night to fact check). They have been in business since 2010 and they build a few houses a year, mostly right in this area. They started out by showing me the utility room, their copper pipes and their floor joists made of traditional lumber rather than engineered wood. We talked about that last point. 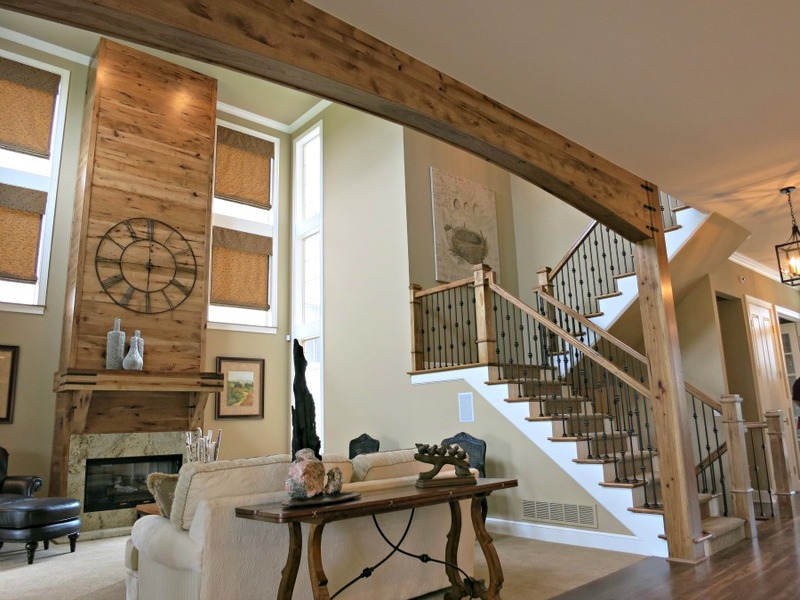 The webbing in the engineered wooden I-beams that have become popular burn through too quickly. Fire chiefs don't like them and the code is changing. 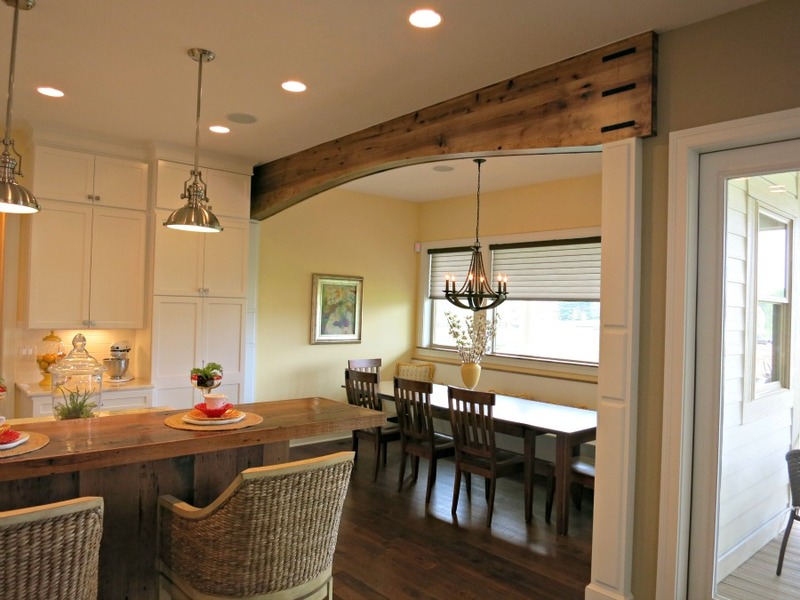 The engineered beams are legal now, but will have to change if they are to stay within code. Prism avoids the problem by using the tried-and-true natural lumber. 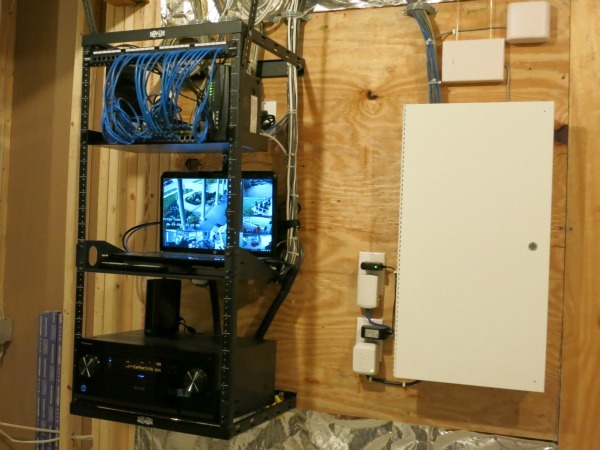 This house is made for those who like their technology. It has some very nice features that will appeal to gamers and those who like to keep their house and goods secure. One of the first things they showed me was their automation system. 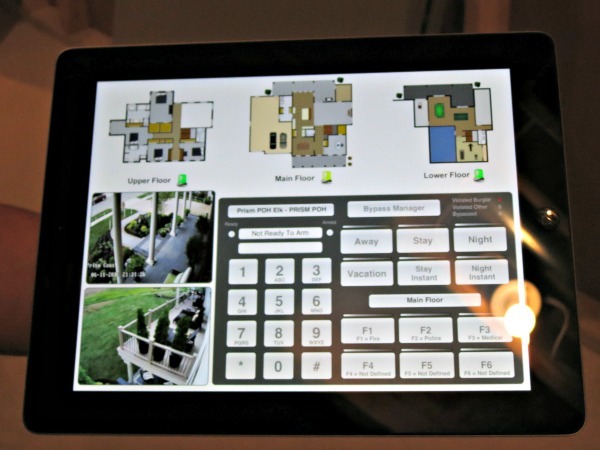 Prism contracted with EZ Integration to provide a combination security system and home automation system. The controls are housed in the utility room. The whole setup consists of a control panel, a laptop, an external hard drive another large box whose purpose escapes me. Click on the picture for a larger view. The laptop screen shows the views from all eight security cameras. Five are setup outside the house. Three are inside shots. The system can hold up to a months worth of footage from all eight cameras at 30 frames per second, but is currently set up to copy over itself after two weeks. 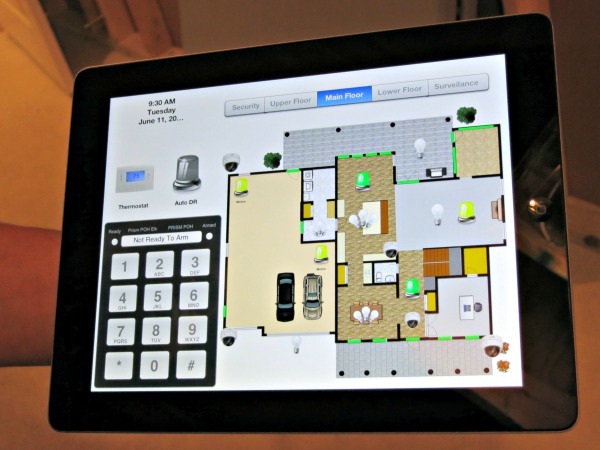 The system can also control things like lighting in the house. For instance it can arrange to turn on the house lights when the garage door is activated. The controls are on an easy-to-use app and can be controlled remotely. That constitutes the practical side of the technology suite introduce by Prism, but how can you claim to be a high-tech house without an entertainment aspect to your technology? 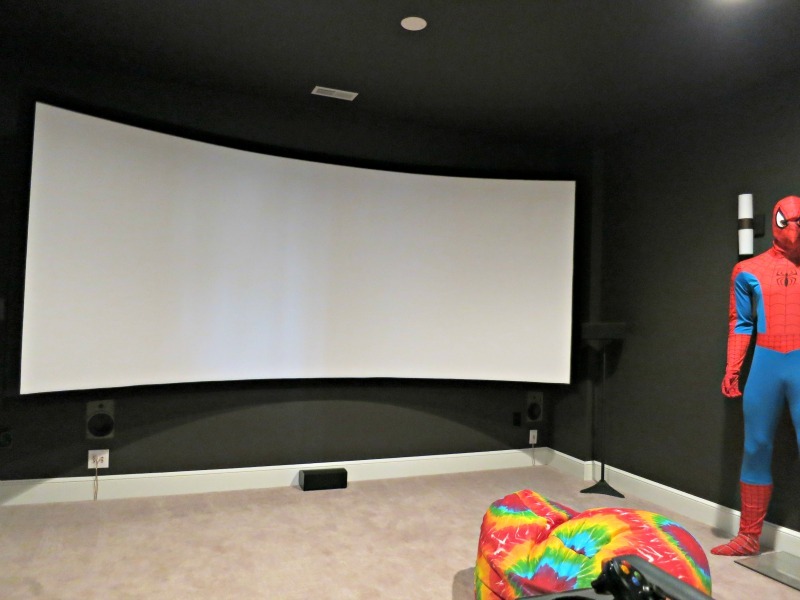 For this they have a special in-home theater/man cave that takes home entertainment to the next level. This is what you call Multimedia Entertainment and for that you need an Immersive Video Gaming Room. See the two pictures below. I think Mike noticed my eyes glazing over when he tried to explain the details of the Immersive Video Gaming Room, and I know he felt a little offended when I referred to it as an In-Home Theater. I am not a gamer. He was able to get my eyes to perk up when I spotted this bit of technology. 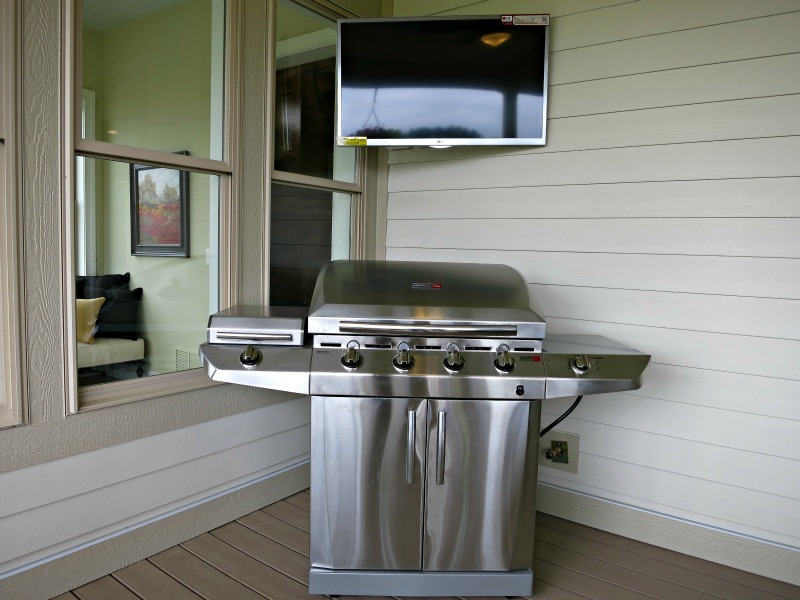 A big screen tv behind the grill seems very practical, if you can keep the smoke from getting the screen all greasy. I don't actually own a TV but I understand the technology and I have been known to burn a few stakes because I wondered away from the grill. This should keep the cook at his station. Below are the pictures I took of the interior. I will keep my commentary to a minimum. When you enter into the house there is a library off to the right and a formal dining room to the left. The French doors leading into the library have a classical feel to them and the dining room, with its wooden wainscoting, gives a deep bow to the Georgian them, but after that the Georgian them dissipates quickly. 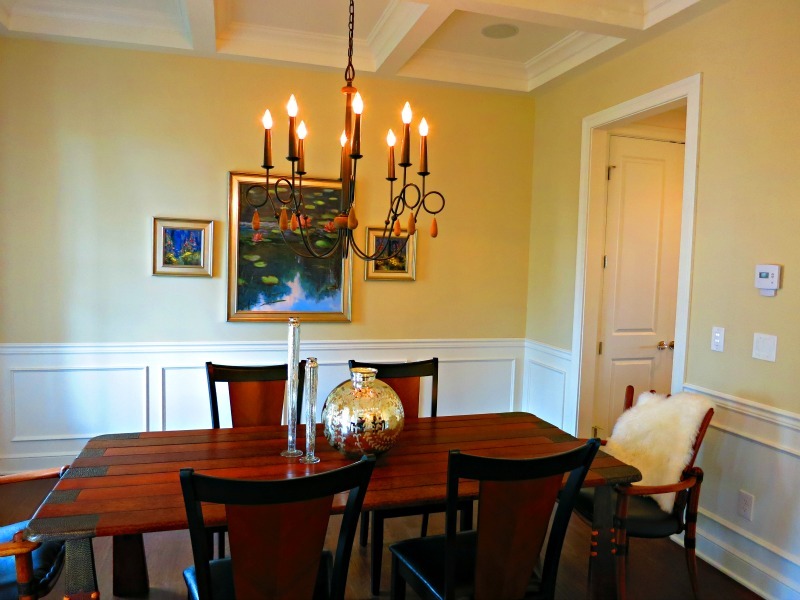 After the entry way-dining room-library combination you enter into an open living room-kitchen-breakfast nook area. This back half of the house is informal, with exposed beams and the wood over the fireplace giving a much more rustic feel. 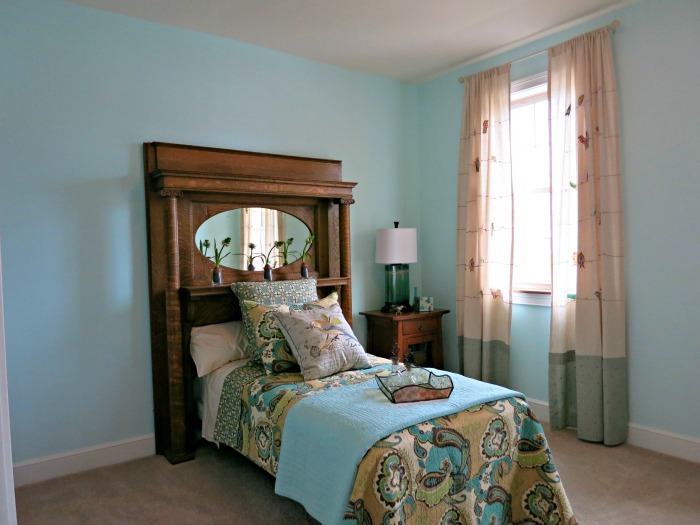 With lots of light pouring in it is an inviting and comfortable set of rooms. 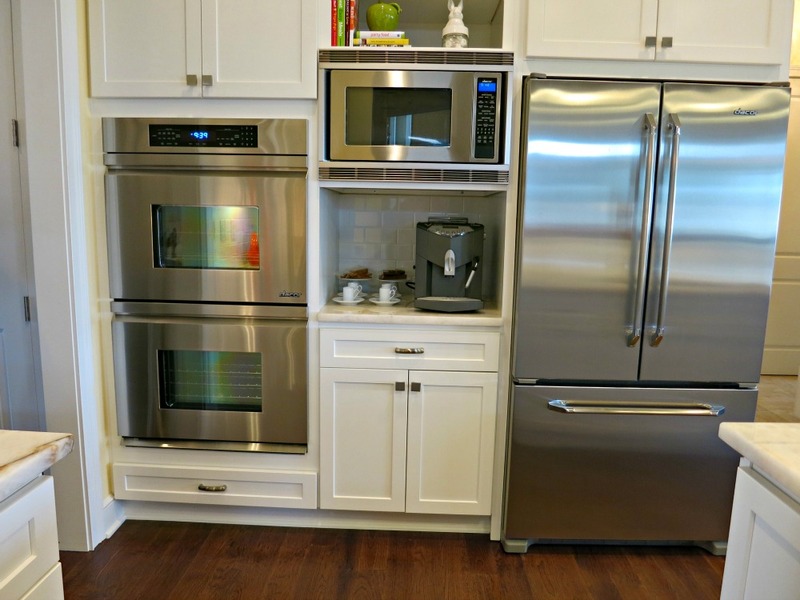 Below is a quick look at some of the appliances. All are by Dacor, maker of luxury home appliances. 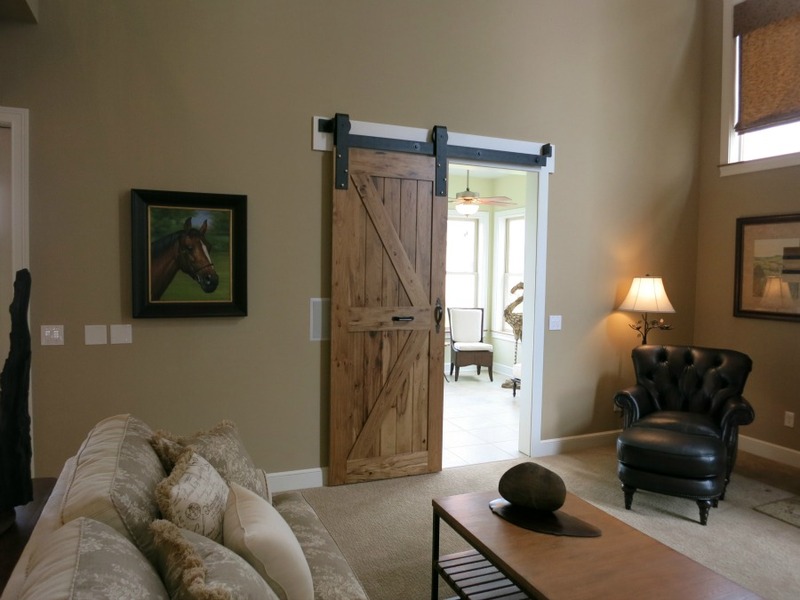 I loved this sliding barn door. Note that this has nothing to do with Georgian. Most of the interior is an eclectic traditional-contemporary fusion without even a nod to Georgian. This is common today, where the outside style has little resemblance to the interior style. The backside of the house was full of inside/outside combination spaces, with porches, patios, and decks. 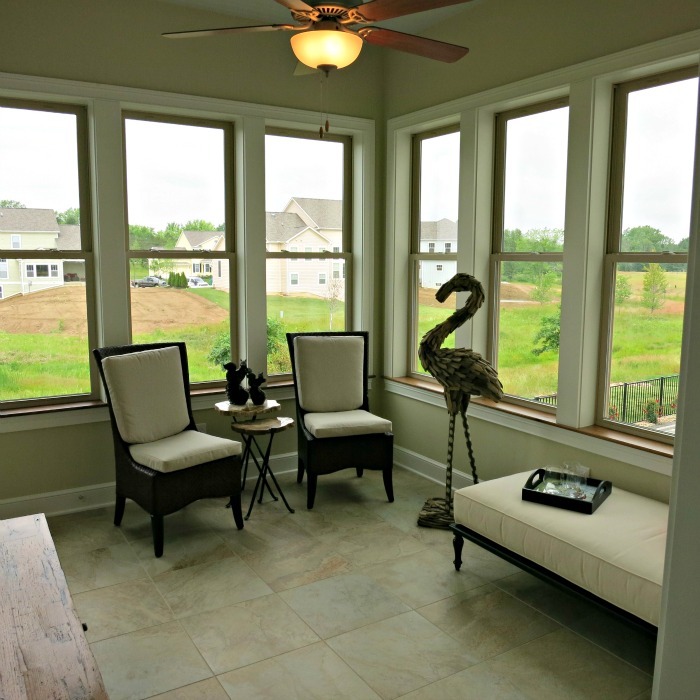 This sun room is strictly inside, but abuts a covered deck and with a view the open spaces behind the house. Below is the view from that covered deck toward the sun room. There is more deck behind the camera that is not covered. Below the deck floor is the roof over the basement patio. The sleeping rooms are all upstairs. 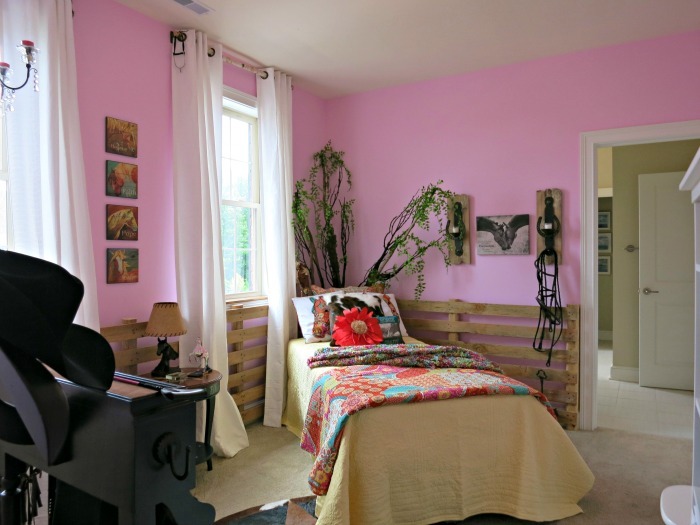 One thing I appreciated about this house was that the decorator was not afraid of color. Too many houses stay with 50 shades of beige. These rooms do not have that problem. The pink and the blue room were easy shots to make. They are both well light, bright rooms. The room with the Harley theme was extremely dark. From this vantage point I am standing in a little ante-room that meets the corner of the bedroom. The ante-room has plenty of light. It would be my reading nook. But a wall obscures the light from much of the room. The light you see coming in through that door on the right is coming in via a bathroom, so much of the time it would be closed. 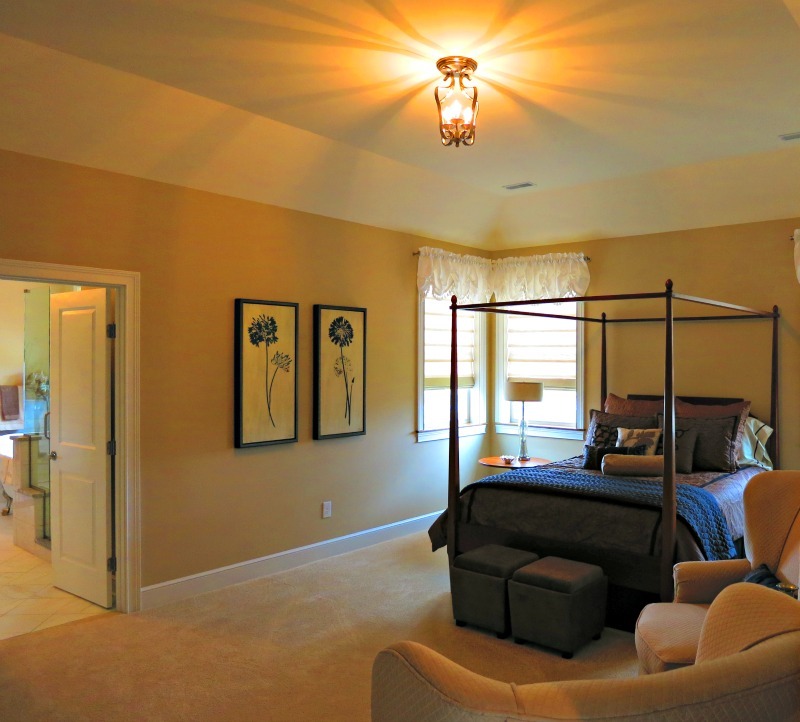 This room is desperate for more natural light and is a great example why rooms need to be lit from more than one side. 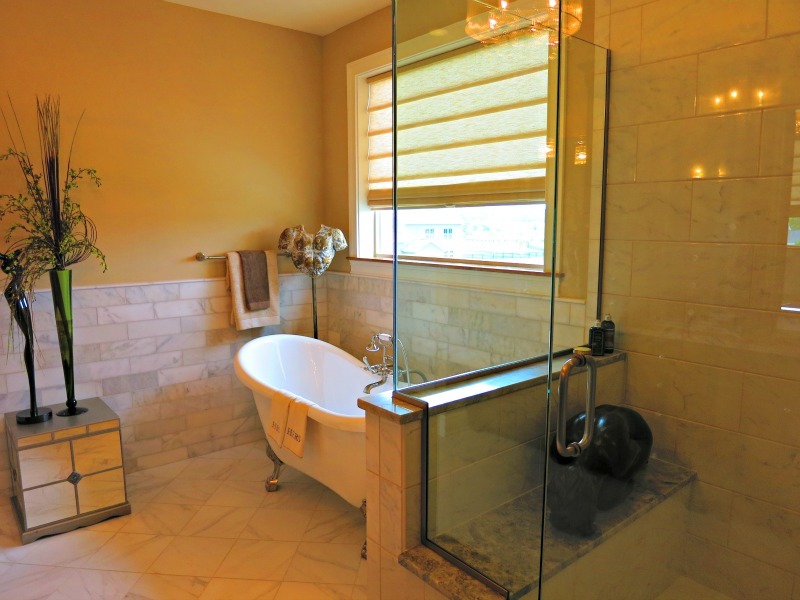 You can click on the master bedroom and bathroom photos for larger views. The basement is where the "Immersive Video Gaming Room" is located. It is a sloped lot, so the rear of the basement is at ground level, but those rooms towards the front of the house have no window. 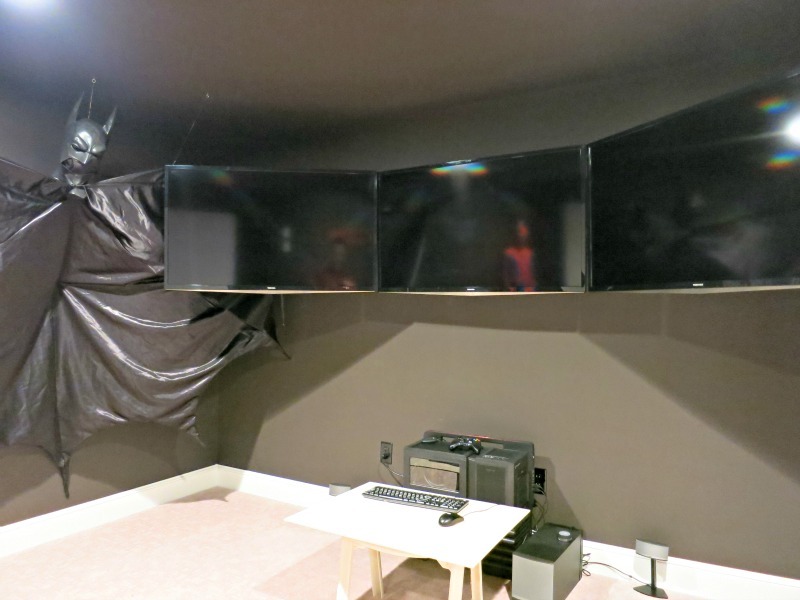 This is perfect for a in-home theater, since you don't want distracting glare on your big screen. This side of the basement also houses a fairly large gym. 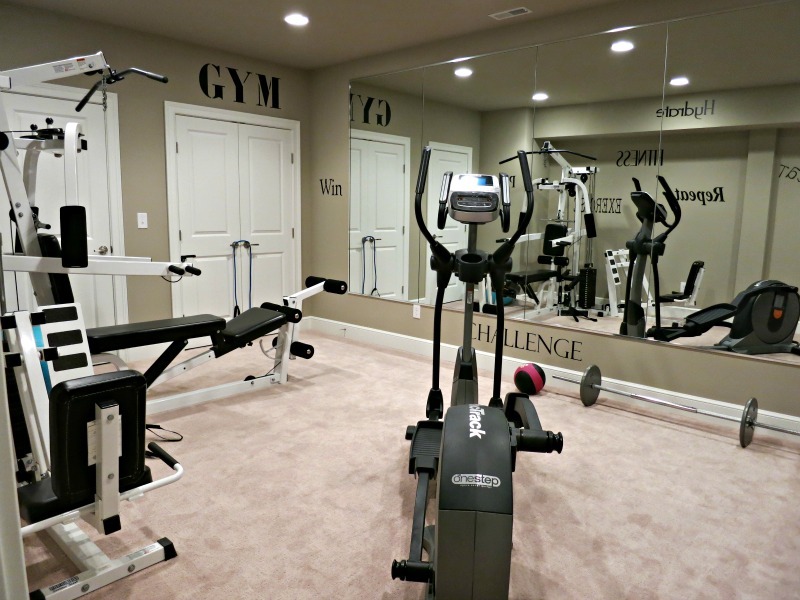 Most people will end up using this as storage or convert it to another purpose but for those who are still under the delusion that they will work out if they actually have a special room dedicated to this function this gym fits the bill. 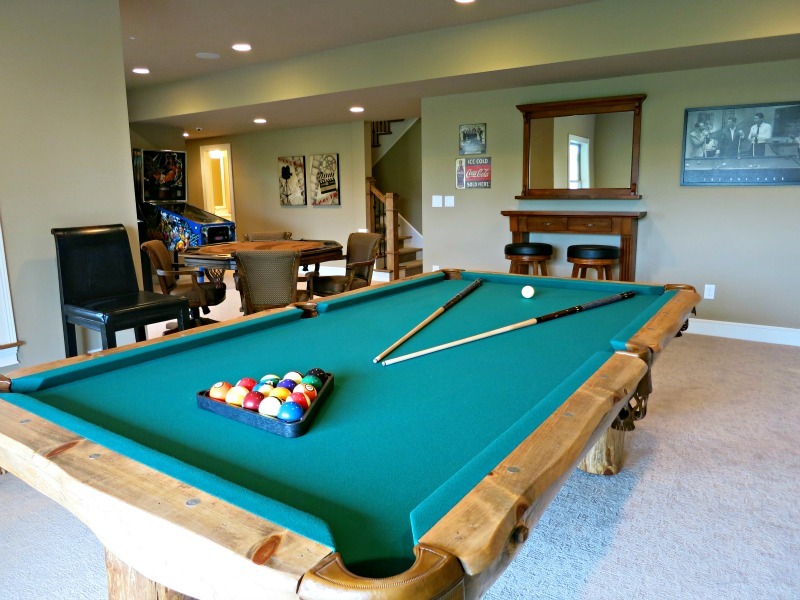 Moving to the back of the house we have a large game room with plenty of sunlight. 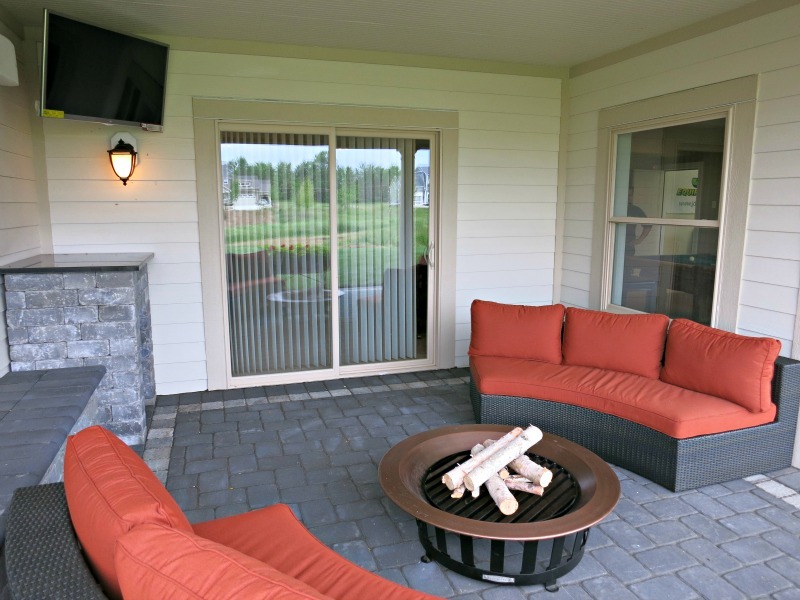 It connects to a very nice porch with a raised fire pit. This house is great for entertaining. 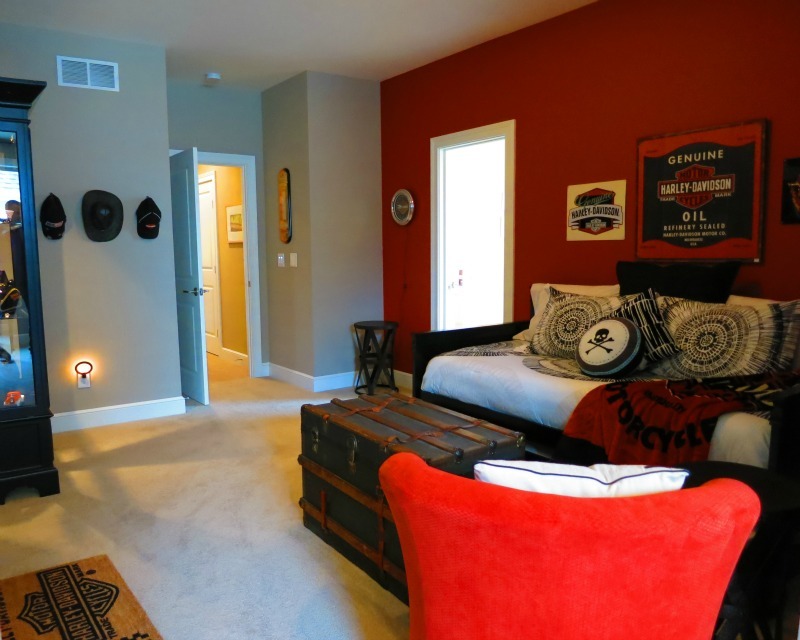 It has indoor-outdoor spaces on both the basement and first floors. By this I mean it has porches that are inset into the house. These loggias provide a nice transition to the fully open deck areas or the yard. All of this happens in the extension of the house that wraps around the Georgian part of the house. 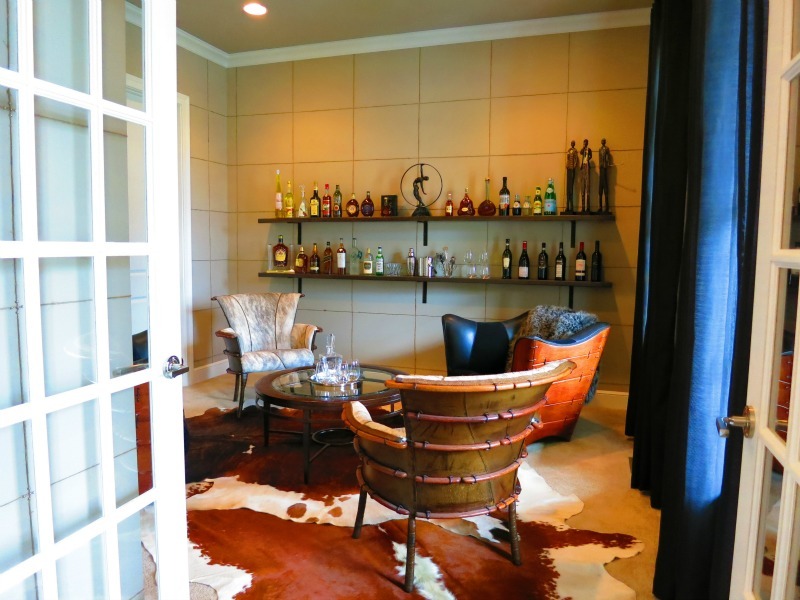 The folks at Prism made full use of this space to create a very special house. i am not enamored with the blending of the Georgian with the wraparound. The style looks a little odd, but functionally it has added a lot of interesting space to the house. 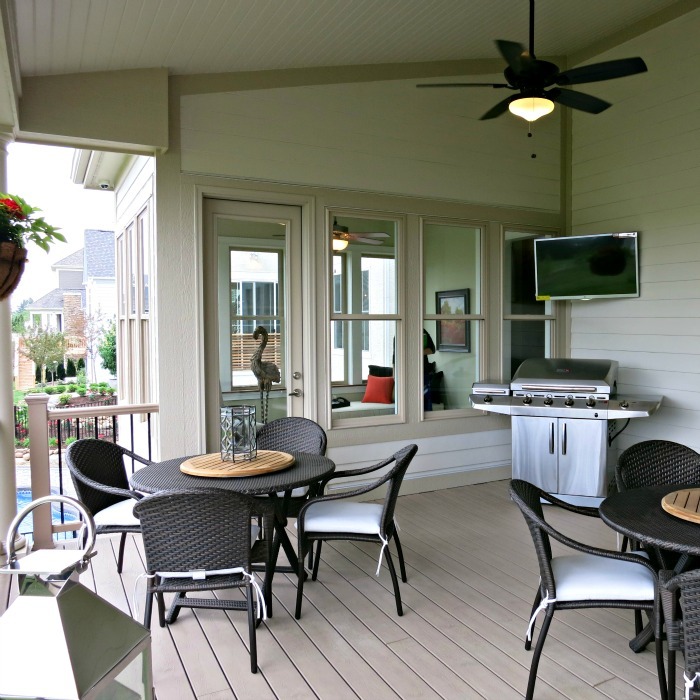 The sunroom, porches, deck and game room all owe their existence to this extra space. 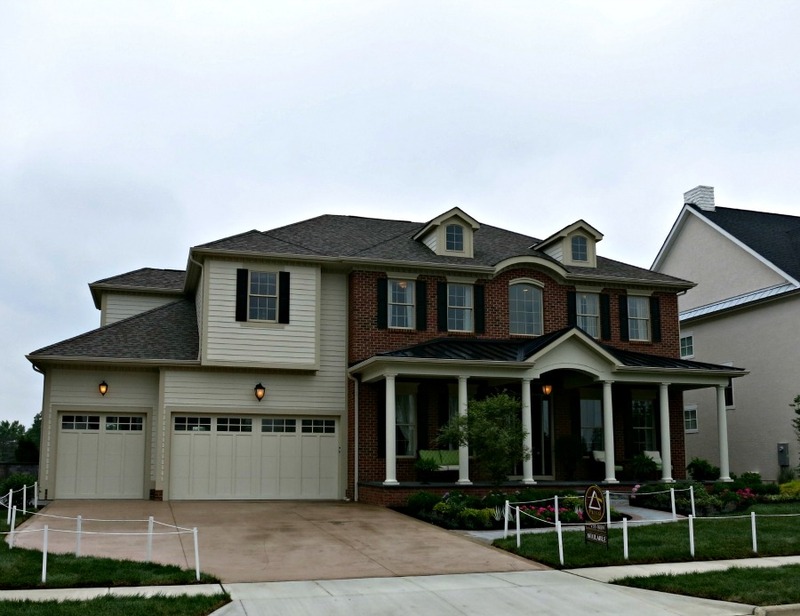 Finally, I wrap up my look at Prism Construction's home with a look at their garden garage. It took a few decades but someone finally figure out that the way to get the junk out of the car garage was to give it a garage of its own. 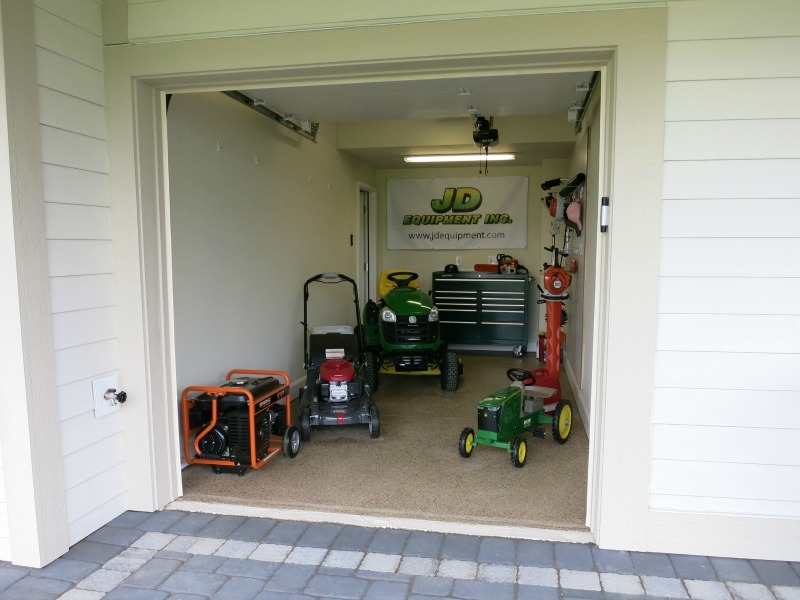 This mini-garage will fit a motorcycle, or a large collection of bicycles, or a complete set of garden-related power equipment. This rids the home of the need to erect a garden shed. Sheds are useful buildings, but a lot of beautiful home have their looks marred by cheap garden structures. People will spend a million dollars on a home, then spend $1,000 at Lowes for a garden shed to keep their lawnmower in. Prism has reduced this temptation by giving you what you need built right into the house.